Rating: 5.0/10. From 178 votes. 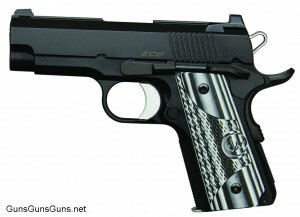 Summary: The description, specs, photo, pricing and user ratings for the Dan Wesson Eco pistols. The Dan Wesson Eco is a 1911-style Officer-size semiauto built on an anodized aluminum frame and chambered in .45 ACP or 9mm. The gun wears tritium night sights with the company’s tactical ledge sight on the rear of the lightweight 3.5″ slide. The ECO barrel is a flush-cut ramped bull barrel with a target crown rather than the traditional barrel and barrel bushing to make the gun slightly more compact and easier to disassemble. The recoil system employs a solid one-piece guide rod and a flat recoil spring rated for 15,000 rounds in .45 ACP. This recoil system is designed to provide a smooth slide for easy operation and low felt recoil. The Eco’s trigger pull measures roughly 4 lbs. The frame features an under-cut trigger guard and 25 lpi checkering. The mainspring housing is also aluminum with 25 LPI checkering and a rounded bottom corner for concealabilty and shooting comfort. These features, coupled with the Ed Brown high-ride grip safety and Dan Wesson’s new slim-line carry G10 grips, are designed to help you hold onto the gun for fast follow up shots and recoil control. The ECO slide and small parts are treated with the company’s matte-black Duty finish. The Eco comes with a Signature series case and a barrel bushing wrench. It should be available in January 2012. .45 ACP, 9mm 7+1 3.5″ 7.25″ n/a 5″ 1.56 lbs. This entry was posted in .45 ACP, $1,251-$1,500, $1,501-$1,750, 1911, 9mm, Compact, Dan Wesson, Semiauto on November 2, 2011 by Staff.